(b. 1966) – a composer, a saxophonist and a clarinetist, a co-founder of the Miłość band, the leader of Łoskot, a composer of music for films and theatre shows. 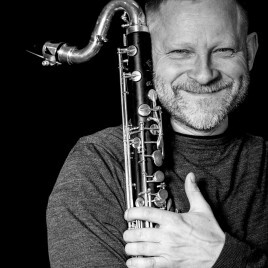 He has collaborated, among others, with Tymon Tymański, Marcin Świetlicki, Andrzej Stasiuk, Yuri Andrukhovych, Peter Brötzmann, Ken Vandermark and Joe McPhee. He is not afraid to cross borders between genres and cultures. He has collaborated with director Wojciech Smarzowski for many years, composing soundtracks for films such as The Dark House, Rose or The Mighty Angel or the Polish TV Theatre show Kuracja [Treatment]. His approach to film music is as specific as the director's films.